I finished this little lady yesterday afternoon, and by midnight (or thereabouts) she was comfortably established in her new home. This is actually the third one I’ve made, but the first one that is fit for public viewing! They’re very fiddly to put together and I’ve never managed to get the others as neat as this, but I tried extra extra hard as she’s a mother’s day gift. I must admit, I was super happy with the way she turned out. 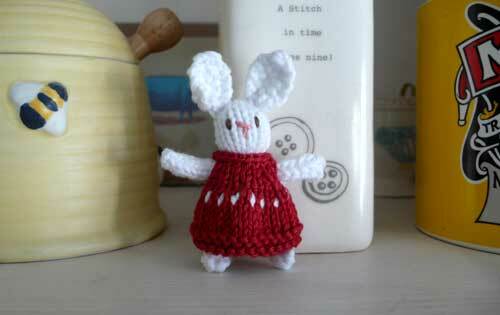 Its the ‘Tiny Knitted Toys‘ pattern, from the brilliant Little Cotton Rabbits. 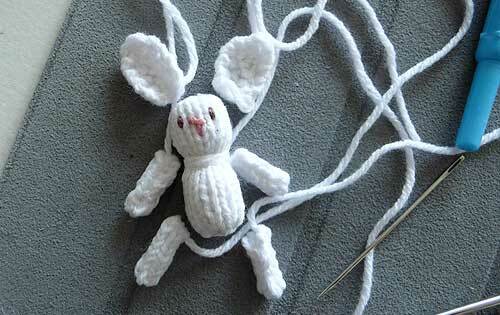 The rabbit is knitted in some spare white cotton I had knocking about. I *think* it’s the cotton I had from the baby blanket all that time ago. Its actually a bit stiff, I think something more wooly could be easier to knit at that size. The dress pattern is lovely. It’s actually got armholes and does up at the back with a tiny button. This was made with what I think is some red Rowan Cotton Glace. It has a tiny sheen to it – very good for small decorative things, and is a lovely deep colour. I must admit, I think crochet is potentially neater for toys. Crochet feels made for creating three dimensional objects, and knitting seems to struggle a bit with that – but to be fair, this is a tiny toy. While I took a lot of care sewing this together, it’s never going to be as neat as a larger crochet toy, and so the dress does help with that a bit – covers up the mattress stitch at the back etc. That said, I feel like making another one. Right now. She looks cute. And I can’t believe you didn’t take the opportunity for a “hare today, gone tomorrow” joke. I literally cannot believe I’ve been so stupid. HOW COULD I MISS THAT?! FOUR YEARS I had to right pun-y headlines for newsletters and I missed that one! Adorable little rabbit! The dress is awfully cute too. 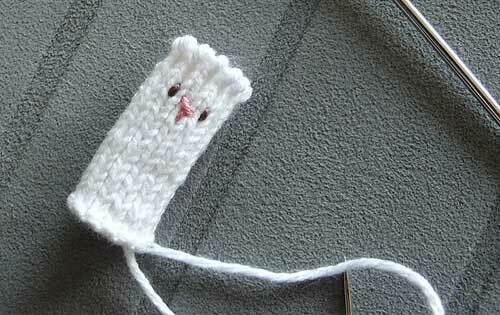 Although I’ve never either knit or crochet toys, it does seem like crochet would be sturdier. 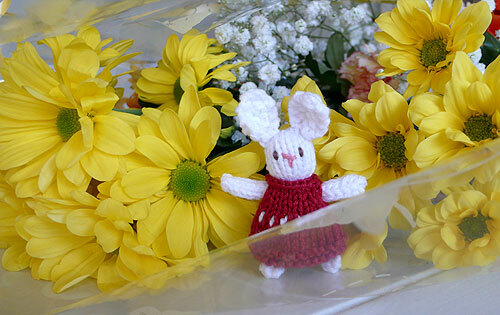 Maybe the idea combination is crochet toy with a knit dress!